I was a CamelBak man! Now I’m a Hydraform Man! I was born with a CamelBak nozzle in my mouth. Ok, I’m not that young, but I used a CamelBak on countless hikes, adventure races, and bike rides sucking on that nozzle like a little piglet would suckle on its mother’s you know what. CamelBak dominated the market. Frankly, it was the only reservoir on the market during the day. However, today, there are plenty of reservoirs to choose from, Platypus, MSR Hydromedary Bag, Nathan Bladder, CamelBak Omega, Inov-8’s Horizontal Bladder, well, you get the point. Just last year Osprey decided to enter the reservoir mix with their Hydraform reservoir. 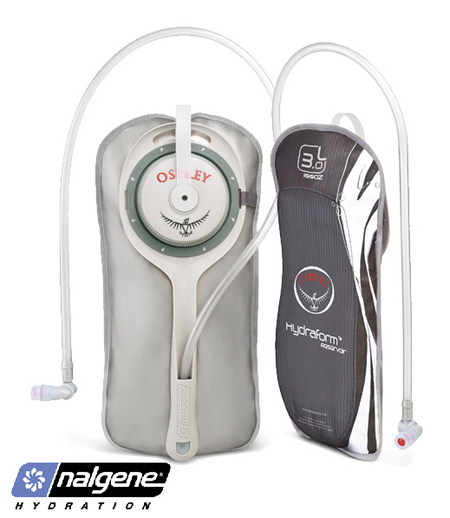 Integrating technologies from the internationally acclaimed bottle makers, Nalgene, Osprey created and offered these reservoirs in their new multi-sport active Hydraulics line packs, the Manta and Raptor. 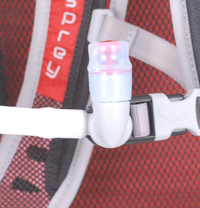 Built with key features like a magnetic sternum strap, a pivoting on-off bite valve, and a semi-rigid form with handle that makes inserting the reservoir into the pack a breeze, the Hydraform works like a charm for mountain biking, trail running, adventure racing, etc. I was skeptical of the rigidity at first, after all I was used to a formless rubber bladder. But after having tried it mountain biking, the semi-rigidity of the Hydraform provided the pack with a stability and level of comfort that I had never experienced with my CamelBak reservoir. It was like the pack was an extension of my back. The feeling of control and stability is similar to the feeling of when you are giving someone a piggy-back ride and that someone is holding on to you tight and securely, rather than loose and limply. That feeling converted me into a Hydraform man. Hydraform reservoirs are available at selected outdoor stores, but currently, MPGear is having a special in that you get a complimentary second Hydraform reservoir with the purchase of an Osprey Manta or Raptor pack.